Invest Northern Ireland has offered support towards the R&D investment, as well as the recruitment of seven additional staff by SciLeads, three of which are already in post. SciLeads’ tool enables pharma and biotech companies to select the best external scientists to partner with on their clinical trials. The detailed information SciLeads pulls together on the scientist helps a company decide whether a researcher is a good fit for the clinical trial. Speaking about the investments, Daniel McRitchie, SciLeads CEO, explained:“The global pharma market is expected to grow to $1.5 trillion over the next three years. This represents a substantial market opportunity for new and innovative services of technology, such as our market intelligence platform. SciLeads has created a unique big data set of dedicated scientific information, using proprietary software and algorithms that aggregate information from online sources. This platform offers easy search and alert services specifically for the scientific market. 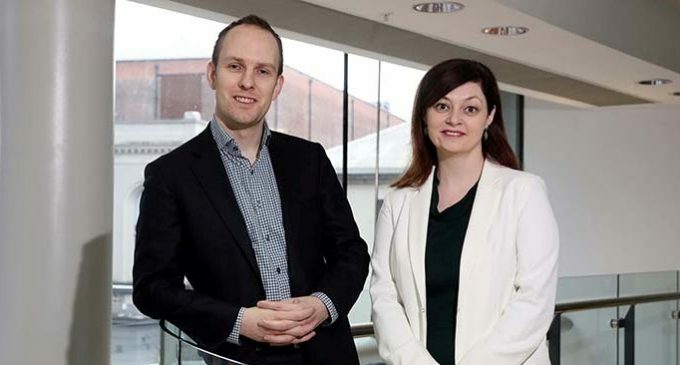 Susan O’Kane, Invest NI Eastern Regional Manager said: “SciLeads aims to be the most comprehensive source of information on professional research scientists and we are pleased to be offering assistance to support this young firm’s ongoing development. Invest NI has offered SciLeads support towards its job creation and R&D investments, part funded by the European Regional Development Fund. The business has also benefited from trade support to explore opportunities across the USA and Europe as well as Proof of Concept grants from TechStart NI to launch its product to market. Pictured (L-R): Daniel McRitchie, CEO, Scileads, with Susan O’Kane, Eastern Regional Manager, Invest NI.